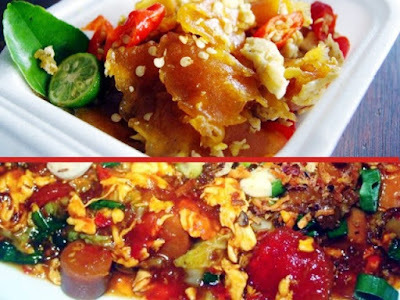 Seblak so popular in their home areas, namely West Java, especially the city of Bandung and its surroundings. If we happen to pass to the city's development could not hurt for taking the time to sample the delights of spicy wet seblak tempting. Foodies may be many who are trying out a snack this one, but what if we live outside of West Java and there are no sellers seblak? How to create a distinctive egg wet seblak Bandung fairly easy especially when we used to cultivate their own food. There are some materials that need to be prepared to make a savory spicy wet seblak are the main ingredients and additives. Additional ingredients here are optional depending on our tastes. Such materials include beef meatballs, sausage, chicken claw cooked meat even, we can add one among such materials or combine them according to taste. 1 handful of crackers raw starch, approximately 50 grams. Supplementary material, can choose one of them or a combination. Here we chose meatballs and sausage as a complement. 1 piece of sausage and 2 eggs were sliced ​​beef meatballs the size of a bit thin. 1 sprig of chives, cut into small pieces. Fried onion taste (for topping). Salt and flavoring to taste. 5 pieces of cayenne pepper (can be more or less depending on taste). 1 point hazelnut (if you like). Powder, approximately the size of a fingertip. Boil water and soak raw crackers until melted, remove from heat then drain and give a little cooking oil that does not belong together, stir well and set aside. Grind spices should be crushed, heat a skillet and saute the ingredients that have been refined until fragrant. Enter the meatballs and sausages are sliced, leeks and celery and stir well. Enter the crackers already dilumerkan earlier, stir again. Enter the beaten eggs and stir a bit faster so that the eggs do not agglomerate. Give a little water and add salt to taste as well as flavor. Let sit until the water is somewhat reduced and then dab a little soy sauce to strengthen the sense of water and stir until completely dry out. Pour into a bowl or serving dish and sprinkle with fried onions on top. Seblak wet spicy savory ready to be served and Eat while hot. How to make a typical egg wet seblak Bandung actually have multiple versions. There is an option in which the egg is inserted in advance so formed into a scrambled egg, there was also entered during cooking. It all depends on our tastes and varied as what remains wet seblak also delicious eaten especially during cold weather.